I love all kinds of stir fried rice noodles to name a few like Malaysian/S'porean/Bruneian chow kway teow 炒粿條, Thai pad thai, Hong Kong beef with soft scrambled egg 滑蛋牛河 (wat dan ngau ho), but today I am cooking Hong Kong style dried stir fried rice noodles with beef 乾炒牛河 (kon chow ngau ho), similar to chow kway teow. I have eaten many kon chow ngau ho 乾炒牛河 in Wong Kee (London China town) years ago when I was still a student. Those days we have no money to splash out on expensive meals we tend to order what we the Cantonese called dip tau fun 碟頭飯, meaning a all-in-one plateful of rice/noodles. Rice noodles can be a pain to stir fry. If you don't know what to do you will end up with a pile sticky horrible looking mess and half sticking to your wok! I find fresh rice noodles bought in the far east are much easier to stir fry. I seldom buy fresh rice noodles in England find them stick to the wok or clump together most of the time, same experience in US. I don't know why. With this Kon chow ngau ho 乾炒牛河, I am using dried wide flat noodles. Not too bad, quite tasty. Need a bit of time to prepare the noodles though before ready to stir fry. Or you can prepare the noodles in advance leave in the fridge within a day and cook when needed. Soak the noodles in cold water for about 30 - 40 min till soften. Drain and put noodles in a colander. Boil about 1.25 little of water. Put colander in the sink. Pour boiling water onto the noodles, while shaking the colander. The noodles will become more pliable. Shake the noodles vigorously to remove any last trace of excess water. Immediately toss the noodles with some cooking oil and sesame oil. Making sure noodles are evening coated with oil and nicely separated. Use a pair of chopsticks to toss is much easier. Leave noodles aside to cool. Mix bicarb with 1.5tbsp water then mix with beef. Leave aside for about 15min. Then mix with remaining marinade. Leave for 20 - 30 min. Mix the sauce together in a small bowl. With a very clean wok. add a little oil and swirl oil around to evenly coat the wok. Remove any excess. Heat the wok till lightly smoking. Put in the noodles and gently tease apart with pair of chopsticks and turning lightly. Cook noodles till heated through (about 2 minutes, not too long or the noodles will start to clump together), drizzle on 3/4 of the sauce while stirring to evenly coat noodles with sauce. When done remove noodles, put aside. Heat wok till hot. Put in about 1 tbsp oil and add garlic. Add in beef. Stir fry till colour changed but still a bit pink. Remove and set aside. 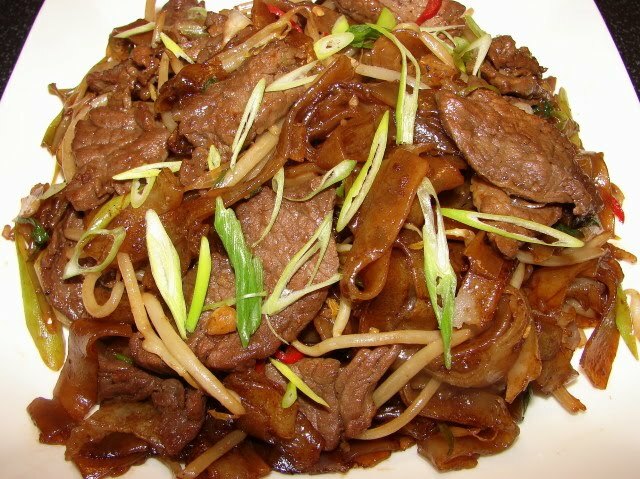 Put in a little bit more oil, stir fry the bean sprouts till lightly soften, add in the beef and spring onion. Stir then add in the remaining sauce. Mix evenly. Then add in the noodles. Stir and tease apart with pair of chopsticks to ensure noodles are separated. This will take about 1 - 2 min. When everything are evenly mixed. Plate up. Heheheh! There was a tine when I was a student that we would go to Chinatown to eat too! Although I would eat See Jiw Ngow Hor - the one with the flat rice noodles as a base topped with green pepper and beef slices in black bean sauce! Sluuurp! do you get much 'wok hei' with your method of cooking the ingredients separately, and combining them later? i have tried this method many times and have never achieved any satisfactory wok hei. for me, all variations of stir fried rice noodles (ho fun)must have 'wok hei', especially in chow kway teow. And the only way i can get maximum wok hei is to use a large enough wok so that i can push the noodles or whatever up the sides and have enough space in the center of the wok for the next batch of ingredients. 1. The fire must be super strong, not with any std home cooker stove. If you have a S E Asian single round head stove you may be able to adjust the gas flow to give you super heat. 2. You will need a lot more oil to give you that smoking flavour, it's the smoking oil that gives you the wok hei. 3. You will need to toss the food towards the edge of the food to catch the fire. I don't have the strength to do this. You can try. With my method it's not super wok hei but acceptable to me. Way too much sesame oil. Should be just a drop or two in the marinade for the beef. Most westerners use way too much sesame oil. Too much sesame oil? That's your preference but not mine. A drop of two is undetectable may as well forget it. If there is too much bicarb you can taste it. You can rinse the beef if you like but this will make the beef too wet to stir fry. For this amount in this recipe I ever bother to rinse tastes fine.